Shay has never really felt like a person. Plagued with an undiagnosed and incurable blood disorder, she's lived her entire life feeling like her disease defines her. Shay isn't really living, and she doesn't have much time left. But then her stepfather and renowned doctor, Martin, starts a new treatment of blood transfusions, and during the transfusion, she experiences vivid dreams of a young man named Gabriel who lived centuries ago. This treatment makes her feel stronger and more alive than she's ever felt in her entire life. Suddenly, she can do things that she always wanted, and she has the strength to be a regular teenager. But the treatment comes at a price: one night, Shay finds the young man she dreamed about, Gabriel, locked in a room at Martin's office, and when she helps him escape, the terrible truth about her treatment and his past comes out. 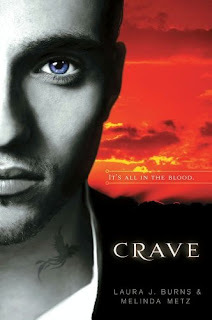 Crave steps out of the tired YA vampire novel mold and is a clever and immensely entertaining story with a unique heroine. Shay's illness brings up a lot interesting and introspective issues for both her and the reader to wrestle with. For example, are living and surviving the same thing? Is it Shay's disease that makes everyone see her as "Sick Girl", or is it her attitude? But despite her physical weaknesses, Shay is strong mentally and her humor and candidness when dealing with Gabriel is refreshing. Their eventual romance is thankfully not due to some intangible and indescribable "connection". Shay sharing memories with Gabriel provides her initial attraction to him and allows them to bond as they make their escape, but it's not a love-at-first-sight and happily-ever-after situation for the pair. Gabriel has his own hang-ups concerning humans that aren't easily overcome and cause friction between him and Shay. Coupled with the mystery of the falling out with his best friend and Shay's own past, there are plenty of questions that demand to be answering as the pair work together to escape their true threat and race to find a cure for Shay. Burns and Metz account for every single detail in this romantic thriller, making for an absorbing read with a killer cliffhanger. Readers will be left with one burning question: where is Crave’s sequel? Cover Comments: The guy on the cover doesn't look like how Gabriel is described, but that's all right. The sunset in the background is significant to some scenes in the book, and I like how vibrant the colors appear next to the black and white of the guy's face. It's a very cool cover, and I'm eager to see what the sequel's will look like! Oooh, this sounds really interesting! I think I'll definitely have to give it a read. I hadn't heard of this book! I'll definitely have to look into it! I love the cover! Miss Remmers: I hadn't heard of it either until Amazon recommended it to me, and I liked the cover, so I downloaded a sample on my Kindle and liked it a lot! Funny how some books get all the attention. Glad to hear this one is original and different! I love the concept a lot. I JUST read and reviewed this one. I really liked it. I liked that though the characters' relationship was only beginning, you could see what they saw in eachother. I'm dying for the sequel now though. I can't lie, I'm kind of torn. I've read so many urban paranormal YA novels in the last two years, I feel burnt out. But this story does sound different. Hmmm...I may have to add it to my TBR list.